Transformers, due to its long history and multiple continuities, has spawned a host of memes. Please separate them not just by type of media, but series it was based on. Fandom and wiki memes can be separate. Meme name: description of meme and how it's used. Source of meme and fandom it relates to. Famous instances (such as the Rickroll during the Thanksgiving parade). Further mutations and successor memes, if any. If you don't bother explaining your example, it will be deleted. Pokeformers was a completely unironic nickname for Armada, by people who disliked the focus on trying to collect all the Mini-Cons and sought to take the series down a few pegs by comparing it to Pokémon. It was later pointed out that Pokémon focused less on collection than Armada did. JaAm is a reference to a silly fan edit of a pack-in mini-comic written in three languages, and thus which had tiny writing and stilted dialogue. A fan edited it to be about a retarded Hot Shot being obsessed with jam, complete with bizarre capitalisation. This exploded on the fandom, and imitators have popped up every so often since then. Other bits of dialogue from said fan edit include "My LifE iS pAiN", "WhY mY SHoUldErS HuRt? ", and, to a lesser degree, "i eAt yOuR bAbIEs!!" JaAm has become an Ascended Meme and was featured both in the bio of the Universe/Classics Hot Shot toy, and on the toy's license plate. Thanks to the animated movie, fans tend to reference Stan Bush's "The Touch" whenever a character does something cool. "Dare" is a popular second choice. In the same movie, when Springer tells him that Kup and Hot Rod's shuttle was shot down, Ultra Magnus says that he "can't deal with that now." Hence, he's constantly quoted as saying he can't deal with anything at the present time. Another one from Magnus: "Open! Damnit, Open!" Uttered when he tried to unleash the power of the Matrix of Leadership to defeat Galvatron. Speaking of Springer, we have better things to do tonight than make memes! The words Optimus Prime probably wishes he'd never uttered: "One shall stand! One shall fall!" Prime and Megatron's fight contains lines of dialogue quoted both by fans and in other Transformers works. "Why do you throw away your life so recklessly?" and "You who are without mercy would now plead for it?" are some of the popular ones. "This is bad comedy!" A certain make-up wearing Evil Overlord has taken to spreading this meme. In another scene, when arguing over who should succeed Megatron, Soundwave remarks. "Soundwave superior. Constructicons inferior." This was almost immediately twisted into "Soundwave superior. X inferior", where X is whatever the poster is writing about at the moment. When Dinobot of Beast Wars beat Soundwave, Grimlock, and others in the fan Hall of Fame poll, this spawned the meme "SOUNDWAVE INFERIOR. DINOBOT SUPERIOR." and similar terms. Now we have "Soundwave superior, Airachnid inferior" coming from Transformers Prime. Simon Furman's repeated phrases are so popular it's a rare piece of fan work that doesn't include a couple. Ascended once Furman himself caught wind of their popularity among fans and started deliberately using them. That, and as Ironfist's "Fisitronisms" from Transformers: Last Stand of the Wreckers. Memes are the right of all sentient beings. G1 Optimus Prime's motto is probably the most well-known and most played about with. David Kaye adlibbed Beast Megatron adding a rather gloaty "yeeess" to the end of many sentences. This was very memorable and catchy, and fans constantly add it to the end of sentences referencing either Megatron or Kaye. It's also persistently misquoted as "Yessssss." The universal greeting, Ba Weep Granah Weep Ninny Bong, turns up everywhere, and is a common subject line when new members introduce themselves on Transformers-related message boards. Universe Razorclaw had the infamous "Know that I am Razorclaw..." speech. Thanks to this, fans tend to discuss him with phrases like "KNOW that Razorclaw did this!" Mind you, there are at least three other versions of Razorclaw, and all of them get references to this in their wiki entries. Prime was described at BotCon as being 'rightfully huge'. The fandom adopted this term to describe absolutely every single thing in the series. 'Dull Surprise!' caught on in the fandom after the Dreamwave G1 comic was absolutely chock-full of it. 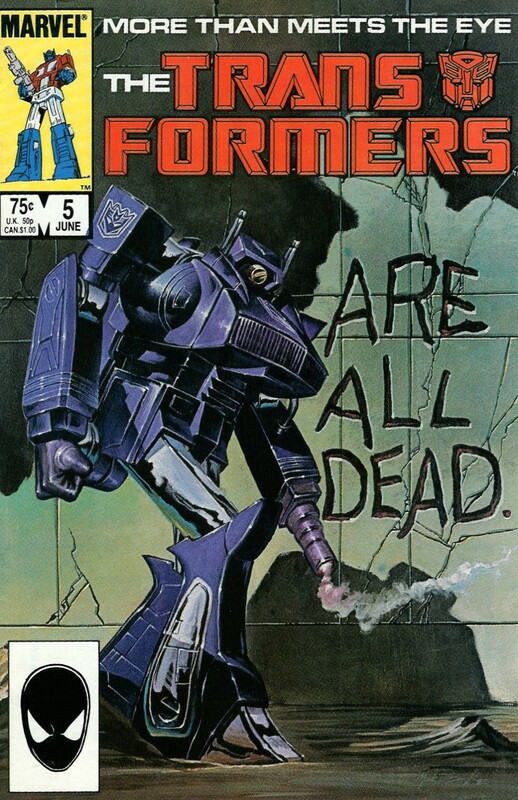 On at least one fan forum (for the curious, Transformer World 2005), the recent release of a Straxus figure in the Generations line (officially called "Darkmount" for trademark reasons) has led to mutations of one of his earliest lines in the 80's Marvel comic, "Mercy is not dispensed here, fools--only death! ", such as the figure riding a bike (itself a Transformers figure) and holding a guitar with "Mercy is not dispensed here, fools--only awesome! ", or the figure surrounded by booze bottles with "Death is not dispensed here, fools--only mercy!" And now, thanks to a misspelling on Animated Straxus' Formspring, Straxmus was coined as a holiday by Derrick Wyatt in which people insult and annoy Straxus, who's played by a fan as an Expy of Morbo the Annhilator. Becomes an Ascended Meme in Transformers Prime, where a fire extinguisher rapidly becomes Jack's Weapon of Choice. In Glorious Transformers Animated, Lugnut's glorious habit of gloriously referring to the glorious and mighty Megatron, (glorious leader of the glorious decepticons) as well, glorious, has gloriously attained this glorious status, for the glory of MEGATRON!! Lugnut's Megaton Punch was named in the fanon as the Punch Of Kill Everything. Ascended Meme. The creators of Animated liked it so much they made the name canon. "Wazzzpinator haz planzz....." was only ever said by the original Waspinator twice, but it has become one of his most beloved lines. With him in the running for the Hall of Fame, many have joked that this was his plan all along. Shattered Glass Ravage was originally created by David Willis as a jokey reversal of the normal stealthy saboteur into an loud, energetic attention seeker who's addicted to social networking, and ended up catching on like crazy with his fans and spreading from there. (To the point where sometimes a person who knows almost nothing else about the continuity will still know about him.) Pictures of him waving and variations on his Catch Phrase of announcing "Can U C me totally waving at you!!!!!!" crop up regularly, and he's been given Ascended Meme status by becoming an official character and even having his own back-up strip series in the official Club Magazine. A similar case with Shattered Glass Grimlock. The Shattered Expectations comic portrayed Grimlock as superintelligent. At the time, Sg Grimlock was just a slavering monster. They eventually upgraded him into his current Genius Bruiser status as a result of the fans liking that persona. Beast Wars Depth Charge is sometimes called "Batmanta", due to be similar to Batman and having a manta ray alt mode. Among the Transformers fandom, the "Bonecrusher Hates X" meme, where X is whatever you want it to be. As befits a Merchandise-Driven fandom, it comes from a line in the profile on the back of Bonecrusher's toy packaging that says he "hates everything". It started with buses, as he was seen smashing through one in the movie trailer. This sometimes crosses over into a very similar meme in Left 4 Dead. Thanks to a certain scene from ROTF, the phrase "GIVE ME YOUR FACE" has become a meme whenever Movieverse Prime gets a toy. Sometimes, it even extends to the various other Primes. The meme is so prevalent that the toy of The Fallen was remolded and re-released with a removable face. Fans who dislike the Michael Bay movies refer to them Bayformers(though there are fans who like the movies that call them Bayformers). ↑ A Mondegreen related to this rather hilarious promo for summer, where he says "hot nights". ↑ Used whenever two things are confused with another, based on the outright stupidly hilarious episode "A Prime Problem". ↑ Animated Blitzwing's response to being insulted in the pilot episode. ↑ A long-Running Gag that dates back to his own fanboy days in Transmasters UK, and his worship of Furman. ↑ Transformers Prime Knock Out is voiced by Daran Norris, who also voiced Timmy's Dad on Fairly Oddparents. Used whenever something bad happens to Knock Out. ↑ Spoken by Wheelie at the beginning of Dark of the Moon, which cleverly provides foreshadowing for the rest of the film and basically sums it up. ↑ Spoken by Shockwave in an ad for Transformers: War for Cybertron in response to a question asked by Starscream about choosing the song to fight to. It should be noted that the song was The Touch. This page was last edited on 16 November 2016, at 20:06.